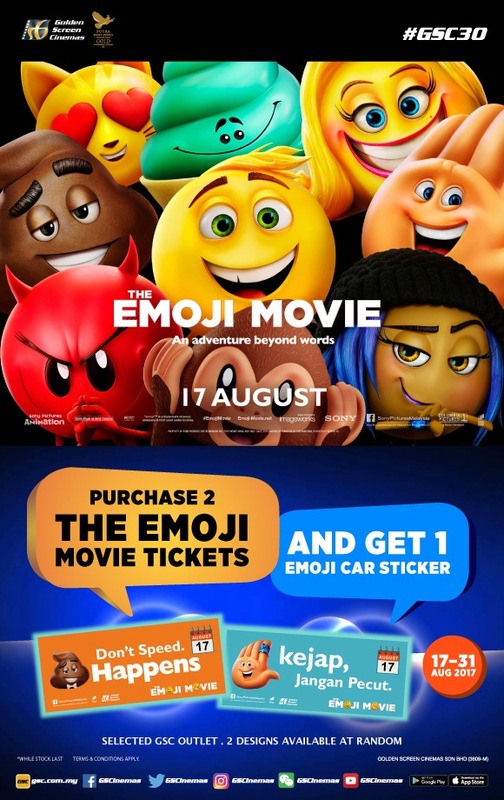 What's in the Offer: Receive ONE (1) The Emoji Movie car sticker (random design) with every TWO (2) The Emoji Movie tickets purchased. Purchase Method: GSC Box Office counter, Website and GSC Mobile App. Visuals are for illustration purposes only. For redemptions via Self-Print tickets of mobile app purchase, please ensure movie ticket is printed at the Box Office. Please ensure movie ticket is printed at the Box Office. For customers who purchased tickets in advance, please return to the same GSC outlet to redeem your The Emoji Movie car sticker if eligible.